Due to my long-standing love affair with salt & vinegar crisps, I wanted to create a snack that could satisfy those pesky salty crunchy cravings. In under 200 calories, it is low in carbs, high in plant-based protein and provides almost a third of my daily fibre requirements. It can also be used as a great topping for a salad, or instead of croutons on a soup. I chose turmeric and smokey paprika in this particular snack but it works just as well with other herbs such as rosemary, thyme, garlic or chilli flakes too. Chickpeas are a wonderful source of plant-based protein and a rich source of dietary fiber. They contain many vitamins and minerals but more significantly manganese and folate. The mineral manganese helps support bone development and wound healing and also helps carry out chemical reactions important in metabolism. Folate, or vitamin B-9, aids in new cell growth and brain cell communication and protects against genetic mutations that can contribute to cancer development. Curcumin is the yellow pigment and main active ingredient in turmeric and has powerful anti-inflammatory effects and is a very strong antioxidant. Curcumin has demonstrated incredible anti-cancer benefits. And when combined with a fat (eg. an oil) and black pepper, curcumin’s anti-cancer effects are further amplified as it becomes more readily available to the body. · Drain a can of organic tinned chickpeas, rinse well and pat dry. · Place on some parchment paper in a single layer in an oven proof tray and drizzle with the oil, toss in the herbs and season with salt and pepper. 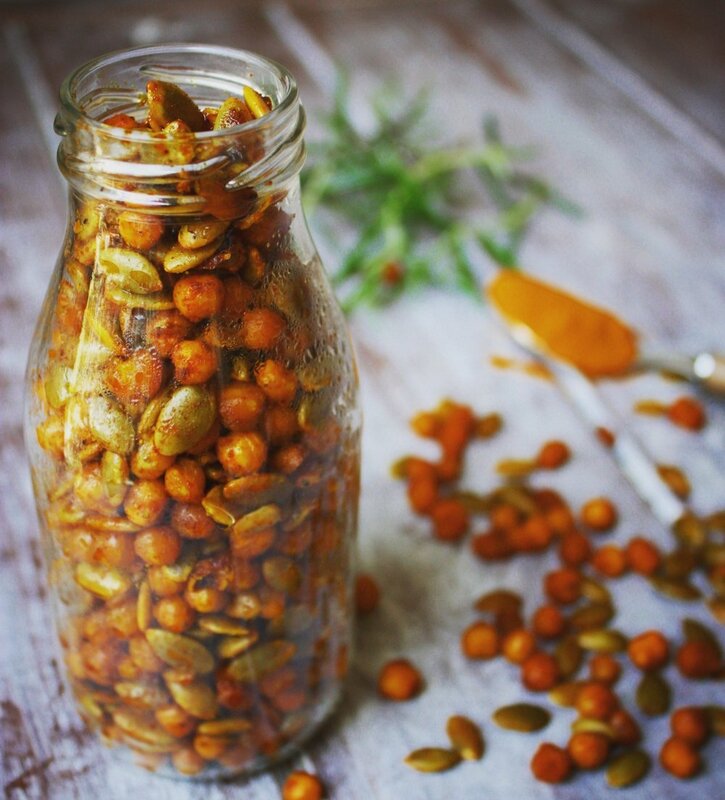 · Cook for 20 minutes before adding the pumpkin seeds. · Continue to cook for another 15 minutes or until crispy and golden brown. · Best eaten warm, but can be stored in an airtight glass jar for a week.